As a statistician and data scientist building the many predictive and analytical models that are needed can be a long and tedious process that uses up resources. Most analytic architectures are batch oriented and are not designed for fast, iterative passes through data for multiple analytical jobs. 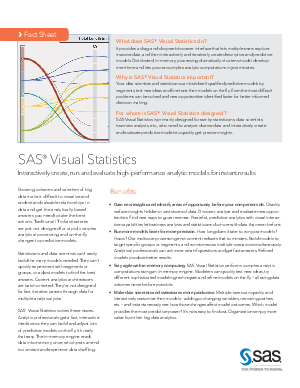 However, SAS has solved this problem with their Visual Statistics interface. Download this whitepaper to learn about the four benefits of Visual Statistics and see how you can interactively create, run, and evaluate high-performance analytic models for instant results.